I always felt like a disappointment to my dad. He was a sports fan. I wasn’t. This letter nails it. 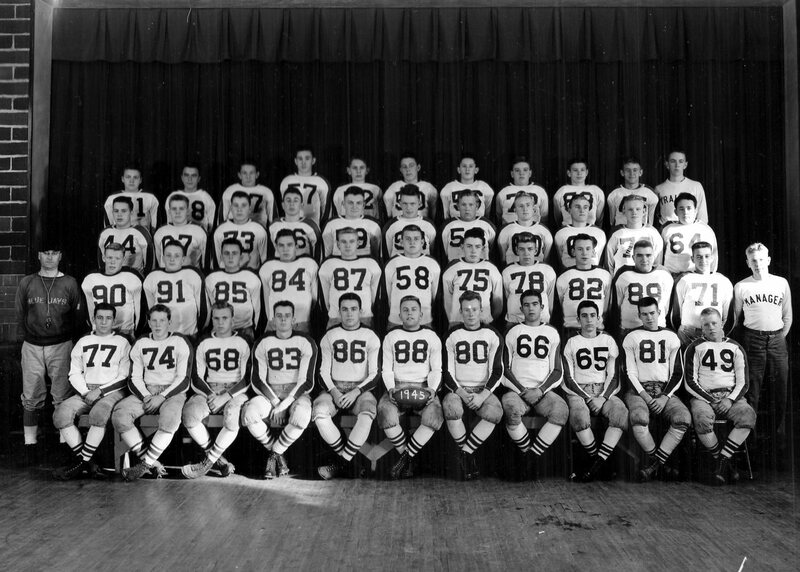 1946 Jamestown Blue Jays: Louie is # 84. Ernie Gates to the left. Photo by King Studio, Jamestown ND. Click to see the large version. Louie’s football coach in high school was Ernie Gates. As luck would have it Ernie was still the Phy Ed teacher and football coach when I came through high school. Ernie had high hopes for me. Then we tried push-ups and the rope climb. Louie describes both below. My record for the rope climb was I maybe made it to the top once. Maybe not. For push-ups, let’s just say that I didn’t make it to double digits. I probably still can’t, but I no longer try. Ernie was disappointed. So was I. I didn’t tell Louie. The one bright spot in my high school Phy Ed career was volleyball. One year we played volleyball every gym class for weeks. Somehow Ernie assigned me to a team that was incredibly good. Just being around the guys who could play made me better. Ernie even made up new rules to make it tougher for us to beat the other teams. I’ve loved volleyball ever since. We played church league, IBM leagues, and we’ve been to professional volleyball games and watched several matches at the Montreal Olympics. The low point in Louie’s thoughts about me and football may have been when I was in college. NDSU had a good team for a couple of years. I went to a game or two. Louie was serving in Korea then, and the Bison made the news over there. He told his army buddies that I played on the team. Oh, well, everyone’s a disappointment to someone. I made up for it in other ways, but I don’t watch or play competitive sports. Louie immediately to the right of front post, partially obscured. Louis to the left of the post, second in dark suit. 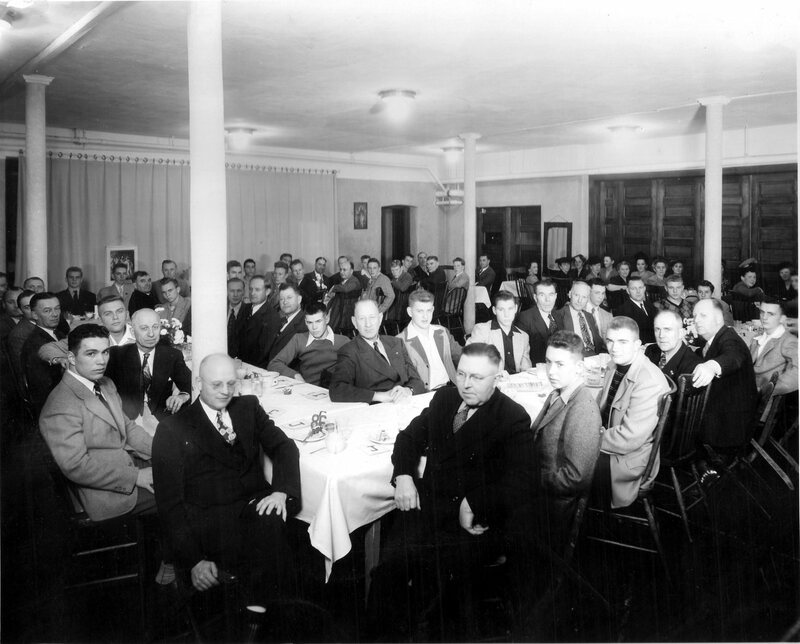 1946 Football banquet. Click for larger version. This old man (fella) is a real sports fan – it goes way back to my high school days. I loved listening to football games on the radio and wishing that I was one of those stars. A couple of years after my not terribly successful attempts at selling newspapers and other goodies, I was ready for my “real” first job. At the time it wasn’t obvious to me how to get a job. Apparently you had to know someone. My job came about because my buddy Don N had just gotten a new job and needed someone to take his old one. This was one of those jobs that convinced me to apply myself at school, go to college, and get a professional job. Mine was a janitorial job at a local dress shop. Three times a week I’d come by the store for an hour or two, sweep the floors, and assemble dress boxes. Apparently they didn’t sell too many dresses, as I could put together a dozen or so cardboard boxes and they’d be good through tomorrow. Working at the dress shop didn’t last terribly long, as my friend Jim (if you read this blog you’ve seen his letters) worked at the North Dakota Credit Union League. He recognized my frustration and their need for someone in the mail room. This was the job for me. Two things in this letter resonate with me. The first is Lucy’s description of the City Directory. My children may have heard of them, but their kids certainly have never seen such a thing. When I was a kid the City Directory was the first class version of the Telephone Book. The City Directory had much more information, things like who lived in the household and what they did for a living. In a sense, it was a corporate census of the town. I didn’t get to see one very often, as they cost a lot of money, but every business man needed one. They may have been a source to determine credit-worthiness. They disappeared in the nineteen eighties, after a hundred year run. Nowadays they’re a good resource for ancestry hobbyists. They hired unskilled people to make the rounds of homes to gather information; a good entry job for Lucy as she tried to get into the labor market. The second thing that brought back memories was Lucy’s mention of Main Avenue. When I moved to Fargo in the fall of 1968 to attend North Dakota State University one of the things the guys in the next room taught me quickly was where not to go in Fargo. Main Avenue was one of them. There were some interesting bars down there, not the least of which was the Pink Pussycat. For several blocks along Main there were nothing but bars, the Salvation Army and the Bus Depot. They were not the place for a naïve teenage boy to hang around. The flop house era was just ending in those days, and single old men wandered about, drunk most of the time, waiting for their big break. For Ken to help those guys out was incredibly charitable. For Lucy to go door to door down there would have been a real challenge. These last couple of letters from Lucy have been difficult for me to read, and even more difficult to comment on. She came through a challenging time in her life, to come out the other side as a successful and joyful person. She mothered a wonderful girl who became the most wonderful grandmother any child could have. Lucy’s next several letters will lift you up even more than the last couple have dragged you through the nadir of her life. Being left with a daughter and mother to care for was only the beginning of my concerns. I married out of high school and had never had a real job that paid a living wage. There was a time in my life when every boy in the class had a job delivering newspapers. It was an easy way for kids to make money and there were plenty of papers being printed. My first job was selling papers on the street. I shake my head today thinking about this job. One of my grade school friends must have talked me into this. We’d pick up a stack of papers at the bus station, probably Fargo Forums or Minneapolis Tribunes. There’s even the possibility that my papers were Grit. Then it’s out to the street to sell them to people walking by. I’ve read stories about kids in big cities selling papers. It was a tough job. It must have been too tough for me, because I didn’t last more than one or two days. My visual memories include dark streets and men rushing by in dark top coats. Then there was the bus station. Are there any nice bus stations in this country? Not in Jamestown,ND in the fifties. Sales has never been my forte. I keep trying, but there are far more failures than successes. After that failure, I moved on to delivering papers to houses in the neighborhood. Maybe I was a little lazy, but the prospect of delivering papers every single evening didn’t seem like a good thing to me. Instead of the daily Jamestown Sun, I picked the Minneapolis Tribune, a Sunday only route.